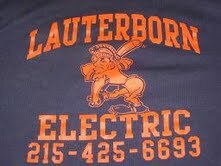 Lauterborn Electric is a family owned and operated electrical contracting business serving the greater Philadelphia area and surrounding suburbs. Our goal is to provide our customers and friends a view of what we as electrical contractors come across on a daily basis. We also want to inform our readers about potential problems and solutions pertaining to the electrical field. Our blogs are intended to give home owners a clearer view and understanding of the electrical trade and what to look for to keep your home, family and children safe. We strongly encourage all comments and questions. Your reaction and participation is essential to the success of our forum.